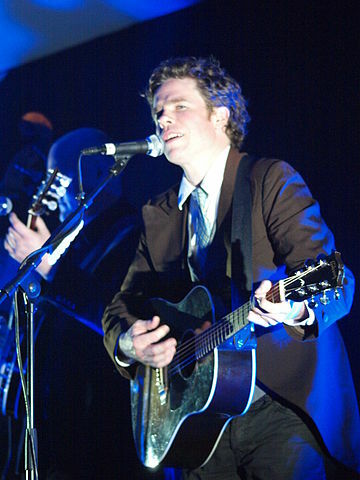 Josh Ritter of the State of Idaho has been composing, singing and smiling through a pretty impressive streak of musical success over the course of a decade and more. This man, a contemporary of mine in both age and region of origin, consistently (a) delights with his lyrical complexity and verve; (b) honors America with his inspired evocations of her lands and people; (c) and, featuring a tight band, simply rocks. What follows is a setlist and brief commentary. No obligation falls on anyone to favor the man’s music; but I do feel obliged to give my reasons for why I do. Listen to those three tunes and you’ll discover a vigorous upbeat rock band backing an American poetic performer of power and subtlety. One of Ritter’s earliest, “Kathleen,” while nearly fifteen years old, has aged extremely well. “Snow Is Gone,” of roughly the same vintage, backs it up. Following all these, “Monster Ballads” seems to me among the most beautiful of its kind in my lifetime. That rounds it out. Ten songs. There is the reader’s setlist. We’ve all watched the Scene in the Errol Flynn type of swash-buckler movie, or read the passage in a book: The Hero manages to defeat single-handedly some of the henchmen and escape the last one, grab a sword, and run after the evil Villain who is trying to abduct his lovely Girl. Villain throws the Girl from himself and turns around pulling out his own sword. The two go at it hammer and tongs, nearly at a match because Hero is tired from a long chase and defeating the henchmen. Out of desperation Hero tries a trick move his (sidekick) Friend has told him about, but he has never practiced, and surprising to both men, it succeeds: it knocks the sword out of Villain’s hand. Villain has no intention of living behind bars or letting Hero win. “Never!” he shouts. Hero magnanimously gestures at the sword on the ground, and says, “then let’s finish this”. I have hesitated thus far to comment on the Charlie Gard case, partly because of acedia. Also, though, because I feared that anything I would say about the difference between ordinary and extraordinary care and about the greater evil of killing people by withholding ordinary care and by active euthanasia would be taken amiss as expressing approval of the UK government's actions in this case. Since in this case they are insisting on withdrawing ventilator support, which I believe is extraordinary care, I hesitate to use terms like "killing" the child, for if it were "killing" here, then it would be killing even when parents consent or other relatives consent to withdrawing ventilator support. It's important for pro-lifers to maintain the ordinary/extraordinary distinction. But at the same time, I am actually heartened even in the midst of this situation by the outrage of so many at the wickedly high-handed behavior of the British government. After all, the parents have raised the money to take Charlie to the United States; the government simply won't let him go. They think they know what is best for him, which is that he should be allowed to die. And that is chilling. In the midst of my hesitation, I saw today a post by a Facebook friend on the subject (though it starts with a different case) and got permission to post it, though anonymously. Though I haven't researched the Italian case he starts with, I fully believe it. It's too typical. My only quibble is with the word "killed" in the final sentence. But there is so much truth here about the lust for power that I decided to let him write most of my blog post on this subject.